This time I bring some material about local feature point detection, description and matching. I was wondering which method should I use for egomotion estimation in on-board applications, so I decided to make a (simple) comparison between some methods I have at hand. SIFT (OpenCV 2.x C++ implementation, included in the nonfree module): The other day I read a demonstration that stated that SIFT is the best generic method, and that any other approach will only outperform it in terms of speed or particularly at some specific function. Nevertheless, you might know that SIFT is patented, so if you plan to use it in your commercial applications, prepare yourself to pay (visit Lowe’s website for more details http://www.cs.ubc.ca/~lowe/). FAST (OpenCV 2.x C++ implementation): I’ve selected this one due to its ability to provide a lot of features in short time. This is probably the faster method for local feature detection. Combined with BRIEF, it can give pretty nice results. Some modifications of it can be found in the author’s website http://www.edwardrosten.com/work/fast.html . ORB (OpenCV 2.x C++ implementation): As an alternative to FAST, ORB (Oriented BRIEF) appears as a natural extension, which provides invariance to rotation (FAST-BRIEF does not). It’s a little bit slower that FAST-BRIEF, but gives nice results. Personally, I prefer not so many features, but very distinctive ones, but, at the same time I like algorithms to run fast. So I would choose SIFT for its robustness, but not use it for being quite slow. Definitely I will not use it if I had to pay (remember, SIFT is nonfree!). I’ve been using FAST-BRIEF and ORB for some time, with good results, but some times they give me too many outliers, so I have to construct RANSAC layers to filter them out. My choice is, therefore FFME. It is almost as robust as SIFT, and slightly faster. Last but not least, it is free. It gives pretty distributed detections (as opposed to FAST or ORB that sometimes give too much features in very small regions), which is very good for egomotion estimation. FFME is a creation of Carlos Roberto del Blanco (http://www.gti.ssr.upm.es/~cda), who provided the source code freely. I have created a C++ wrapper that can be used with the OpenCV 2.x API, as well as the required modifications to compile FFME with CMake. Link to the modified source code (OpenCV 2.x C++ wrapper + CMake) by Marcos Nieto. (https://sourceforge.net/projects/ffme/). The sample contains two folders: /c corresponds to the original code by Carlos Roberto del Blanco with CMakeLists.txt for its compilation with CMake. The /cpp folder contains the full OpenCV 2.x wrapper I did, with the comparison of SIFT, FAST, ORB and FFME, and the creation of the video. This entry was posted in Computer vision, OpenCV and tagged BRIEF, C++, egomotion, FAST, FFME, OpenCV, ORB, SIFT, source code. Bookmark the permalink. Thanks for sharing your works and also for your blog. I’m doing a project based on indoor navigation. What algorithm do you think suits better when the robot i’m building needs to navigate in closed path like in factories and offices and also avoid people and objects? Regarding your project, it heavily depends on the expected result. On the one hand, laser-based sensors can provide the better results in such environments, but their high price (about 3000€+ good ones) make them typically unavailable. In that sense, vision systems can be a very good substitute, especially in indoor environments where the light is more controlled. In such case, I would use stereo vision, since two cameras can provide a solution for depth estimation, while single-camera systems need motion to determine the position. In any case, you will probably need to use bundle-adjustment like algorithms to compute simultaneously the position and mapping. You can find a lot of information elsewhere googling SLAM (simultaneous localisation and mapping). Or is there anyother place i can get Computer Vision based resources i can get for doing this project? I’m doing this project for my Undergrad finals and i want to do my Masters in Optics and Photonics. Yes, definitely that course worths to be watched. I recommend you too to check http:://openslam.org where you can find a pretty large number of open source code for SLAM. There you can search for more resources and samples. can you post link source code for ORB? Hi! Sorry, I don’t use Twitter… actually I don’t think I can generate that much amount of information… thanks anyway! Do you have any examples of open CV library calls (FAST and ORB) using the application with JAVA? How many OpenCV library function call on an application made (which is related to the keypoint detection algorithm for FAST and ORB). Please give me examples of each of its coding to call such functions. Apologies for my late answer. Actually I have not used Java bindings of OpenCV, nor any other computer vision library. However, those of OpenCV for Python and Java seem to be easy to use and speed up your developments (altough at the end I think it is always a good idea to move to C++). I really excited about your work :-) And I wonder how you choose the best set of parameters for every algorithm (thresholds, kernel sizes etc) for your test video? However, a more dedicated effort should be done, and there are methods for automatic parameter finding, such as EM, or even MLE approaches. I admit that most of times I don’t use them, except when I was doing my PhD. Hey marcos, i have to compare a BRIEF and BRISK against SIFT,can u please tell me which one is better BRIEF or BRISK and why? i have a pair of image? BRISK is probably a good default option, although ir really depends on the application and the transforms that may suffer the images. thanks for the reply….i want to know how brisk is better than brief.i have implemented brisk using opencv and then match the features using Flann but i have got the false result.what should be the criteria when matching binary features?..and brief is only the descriptor extractor and brisk is both feature detector and extractor? The University of North Carolina at Chapel Hill ..
Also, they specify that BRISK is both detector and descriptor. i want to know that i have 2 images and diff between them is their viewpoint.i think brief is better in this context? what do u think?? BRIEF is very fast, but not robust against severe geometric transforms. ORB (Oriented BRIEF) would do the job in such situations. In my mind FAST-BRIEF is for small motion (such as egomotion), while ORB-ORB or other (SURF) for tracking, mosaicing and things like that. i have two choices BRIEF and BRISK? Try using BRISK, since its newer, better, and possibly not that much slower that BRIEF. HI marcos, is your site computer-vision-talks.com down? Would you please reupload the modified code. The site http://marcosnieto.net/#Code seems offline at the moment. Thank you. Hi! Now the code is hosted un sourceforge. Please find the link in the code section of this blog. Sorry for naive question. I am new in this field. 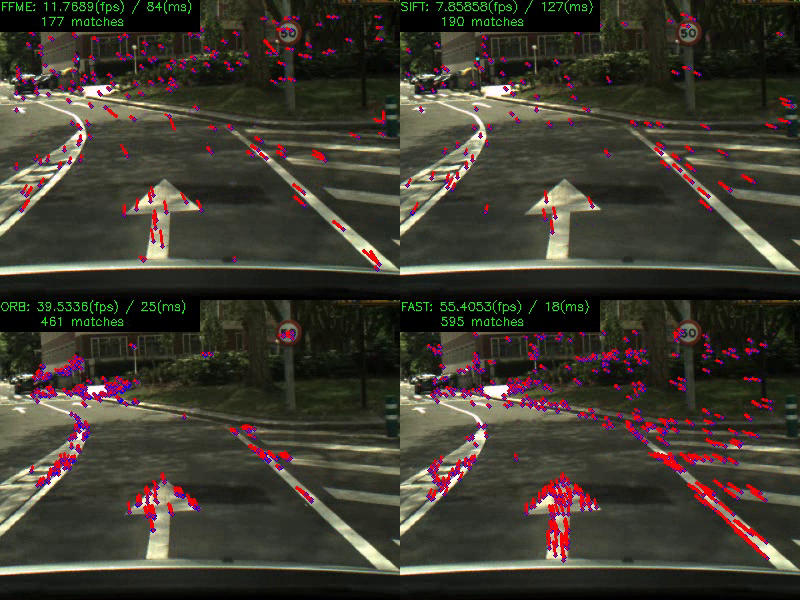 I am also trying to find metrics to compare feature extraction methods for automotive domain for object detection and tracking, particularly in moving conditions. Is your comparison also valid for moving object like padestrians, vehiches..? Hi! For detection and tracking it is probably better using region descriptors rather than point descriptors. I mean HOG (histogram of oriented gradients), HOOF (histogram of oriented optical flow), color histograms, etc, and then use a machine learning algorithm like SVM or Adaboost to train a classifier on a dataset of the objects you want to search. Hi Thank you very much. I will be very helpfull. I have read “Local invariant feature detectors: A Survey”. What other sources do you suggest? I also came across an algorithm by the same people who implemented BRIEF- called as DBRIEF. My aim is to match a single query image against 100 train images. For such an experiment, is BRIEF or ORB better? For such an experiment, is DBRIEF or ORB better? Any comparisons between BRIEF and ORB could also be helpful. I don’t know about DBRIEF, but the main difference between BRIEF and ORB is that ORB is an improved version of BRIEF as it contains “ORientatoin” information. This way, ORB descriptors can be matched even when rotation transforms have happened between images. For your experiment: check if there can be rotation between your query image and the train images. In case not, I would use BRIEF for being faster. Objective is to detect object in human hand , i tried using Opencv Haar classifier but it is not detecting when hand has any object and detected when the Hand is empty. To identify objects you probably first need to find the adequate features that better describe the object and then train a classifier that do the job (typically SVM por Adaboost). In general Haar and HOG features hace shown good performance for faces, upper bodies and full bodies. OpenCV has full support for this. I have an issue of choosing the best detector for AR application on mobile device.so it requires both robust and speed. I found there are many detectors in OpenCV ,such as “FAST \ STAR \ SIFT \SURF\ ORB\ BRISK\MSER \GIFF etc”,and sift and surf are non-free. Could you please give some advise on which is the best option for AR application? This is an interesting question. There is not a unique answer, though. For efficiency, FAST is superior, however, it will cause problems with motion including rotation. The best solution so far is still SIFT, but we know it is slow and you will need to consider patent issues. Other approaches like BRISK or FREAK are emerging as good alternatives. This is the PhD dissertation of a colleague of mine. Hi, thanks a lot for your blog and the pdf. What would you recommmend please? You can probably find tutorials somewhere else (e.g. http://www.morethantechnical.com/2012/02/07/structure-from-motion-and-3d-reconstruction-on-the-easy-in-opencv-2-3-w-code/) because SFM is somehow fully supported in OpenCV. Which edge detection algorithm is more suitable for real-time applications (especially for detecting markers in augmented reality applications)? I’m trying to implement an augmented reality application. I want to use a suitable edge detection method to detect borders of markers found in the real time scene. The edge detector should be robust to reduce false positive rate and fast to reduce consuming time to be suitable for real time application. I know that Canny edge detector is the most commonly used and it is really robust, but it is very slow. I was thinking about using SUSAN edge detector, but I don’t know if it is more or less robust and fast than Canny. I was thinking also about using SURF feature extractor to detect borders of markers, but I don’t know if it is faster or slower than Canny edge detector. Anyone can help me to choose the most suitable method to detect borders of markers in my real-time application? FFME means Fast Features for Motion Estimation. Hi Marcos, I am trying to implement monocular visual odometry in my project using opencv. I have used FAST for feature detection, SURF for descriptor extraction and BFMatcher for matching the keypoints. I have also applied the ratio test to get good matches and remove the bad ones. Now, I want to measure the distance travelled in 3d(or atleast 2d) environment by the camera using the above information. I don’t know how to do that. Do you know any tutorials or sample code for odometry code? I believe you’ve done a significant part of the work! Now, once you have the 3d-2d correspondences you need to create a framework that estimates the pose (rotation and traslation of the camera). If done offline, this is known as the Structure From Motion problem, and if online, Simultaneous Localisation and Mapping. You can probably find a lot of documentation of any of these two types of alternatives. I really believe that if you are entering into the world of computer vision, you need to learn how to use OpenCV. You can follow a number of tutorials to install and start using OpenCV, should not take you more than a couple of hours. How about local motion in the images? Do you think feature detection and motion estimation work well with local motion? I need to estimate exactly local motion and compensate that movement. Final output is no movement subject in the images. I tried most of the latest motion estimation methods, such as Brox, Deepflow, LucaKanade, etc. but they are not effective for large local motion. Im working on HDR imaging and I am using SIFT to find the similarities and warp 2 images. Btw, I want to compute the energy of each pixel in each iteration to use as a weight to calculate the HDR image. so can I have it? As far as I know, the energyList in the program is the smallest for all pixels. So how can I extract the energy of each pixel?